Charlottesville apartment community. 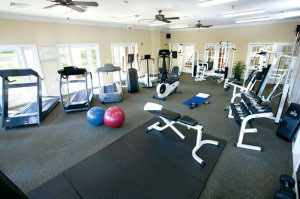 Take advantage of the state-of-the-art fitness center at home and get a great start on the new year. Modern apps and fitness trackers make it possible to bring a personal trainer with you to the apartment fitness center any time you like. Combining streaming workouts that can be used in combination with the equipment in your community’s fitness center allows you to reap the maximum benefits from your workouts and include variety without the trouble of joining a gym. “Fusion” is the top fitness trend in 2019, utilizing programs that mix and match different types of exercise for a comprehensive whole body workout. Yoga now includes medicine ball weights, many strength exercises are performed on the balance board, and integrated motion training exercises improve strength and flexibility simultaneously, targeting neglected muscle groups and boosting the metabolism. 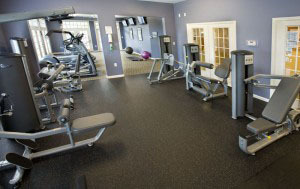 Your apartment community gym is stocked with a wide variety of equipment that will allow you to enjoy some of the more innovative workouts without buying a lot of new training tools. The most popular “fusion” programs are built around HIIT– High Intensity Interval Training. HIIT workouts reduce the time spent exercising thanks to short periods of high intensity cardio activity followed by short periods of recovery or strength exercises. Your apartment fitness center is a great place to experiment with this new trend — you can combine different types of strength and flexibility moves with several types cardio machine workouts. These notoriously short workouts are a great reason to utilize your apartment fitness center rather than traveling 30 minutes in each direction to perform a 15 minute workout. 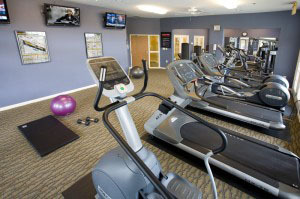 If you haven’t made use of your apartment community’s fitness center, make a plan to visit in 2019. The resources to achieve your best health and avoid expensive gym memberships are right at home!